I'm reminded of a 1985 episode of Cheers I somehow caught as an impoverished student (w/o a television) in which Sam lends Diane $500 to purchase a signed first edition of The Sun Also Rises. Though I wasn't then much of a collector - again, impoverished - I thought the price a wild fantasy. We do see the book - which Sam accidentally destroys by dropping in his bath - but it looks nothing like the true first edition. No, not jewel-encrusted or brightly coloured leather - if memory serves it's red cloth. There's also a bookshop scene in Hitchcock's "Vertigo." Years ago, when I was a grad student in film at Columbia, the eminent critic Andrew Sarris taught many of my classes, and I soon found myself chafing like an adolescent at his strongly held auteurist tastes. In a paper I had to write on "Vertigo," I remarked -- in a deliberate effort to needle him -- that I'd been so bored by the movie that I'd spent most of the bookshop scene trying to read the titles of the volumes for sale and wondering about their prices. When Sarris handed the paper back to me (with a deservedly low grade, I'm sure), I saw that he'd drawn an angry red circle around this taunt and had written, "If you really feel that way, Mr. Klein, I pity you." Thanks Scrbblr, thanks Brian. I too have looked closely at books on screen and I remember a shot of a library in a college room in Brideshead (set in the 1930s) which when I froze the frame I could see the books were mainly Herons in that fake leather known as Skivatex - not really known until the late 1960s. What a giveaway! I recall that in "La Reine Margot" (Isabelle Adjani version) the King of France is poisoned by whetting his finger to turn the pages of a book on hunting whose page corners had been so treated. And, of course, the movie 84 Charing Cross Road (1987). Don't forget 'The Three Mothers' in Argento's Inferno! The opening scene shows the pages being uncut. Books are not vital to the plot of Cronenberg's latest movie, Cosmopolis, but a scene or two are set in a wonderful antique bookshop. I also vaguely recall an episode of Friends which featured the first edition of some children's book as a very meaningful gift to a character. And the very bad SF movie The book of Eli was all about a very precious tome, after all books were destroyed in a clumsy effort to put an end to all wars. Diane bought a signed copy of The Great Gatsby, and Sam dropped it in the bath. 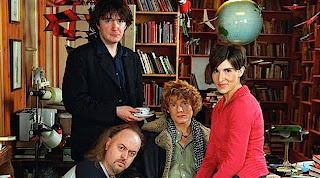 One of Nigel Burwood's former employees claims to be the source for Bernard Black. He is the most affable of people, and he was affable when he worked at Any Amount too. Apart, that is, from the time when a misguided American tourist insisted he be given a discount on a paperback copy of one of Shakespeare's plays. Gareth, was it Gatsby? I seem to recall that it was the shock in learning of Jake Barnes' war wound that caused Sam to drop the book. Doesn't one of the BBC serial of Tinker Taylor Soldier Spy include a scene in which Smiley (Alec Guiness) buys a book in what looks like an antiquarian book shop? Just had to look up that Cheers episode on IMDb. Seems it was The Sun Also Rises after all. Sam: God, it really is a book. Diane: It's a book, and a very valuable book. It's a first edition Hemingway. Sam: The Sun Also Rises. Boy, that's real profound. Diane: I purchased it for five hundred dollars, but I'm sure it's worth a great deal more. It's signed by Ernest Hemingway himself. Sam: For five hundred bucks, you'd think Margaux Hemingway'd come over to your house and act it out for you. Brian - thanks for sharing that. Cheers! indeed. Got a feeling a signed first in a jacket in nice order of 'Sun Also' would be around $100,000 now. Obviously a very old episode. The film 'Wilbur Wants To Kill Himself' is a comedy set around an inherited secondhand bookshop in Glasgow. I would have sworn it was Gatsby, but I was obviously wrong. My award for Most Unconvincing Onscreen Rare Book would go to one of two Amicus horror films: either the Marquis de Sade volume shown in "The Skull", or the book of black magic in "Asylum", which shows how to revive a dead body by dressing it in a suit illustrated with 1972-style huge lapels and flared trousers. 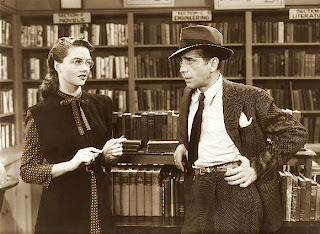 The headed bookshelves behind Bogart and Maloney in the photo above has long amused me. "Novels" to the left, "Literature" to the right, and "Engineering" in between! There is a old bookshop in Patriot Games,which,perhaps, is the image that the public have of a SHB,antique wiring and managers who deliver books in person and who turn out to be a bad guy. 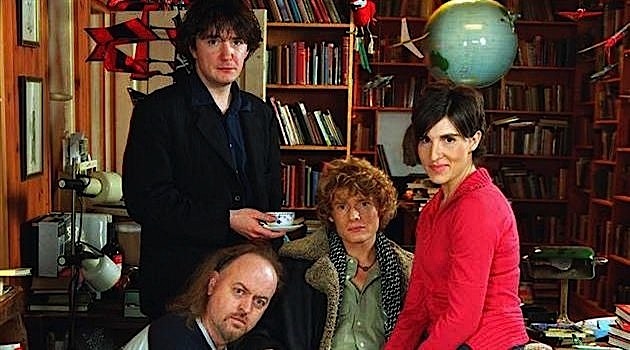 A few episodes of Morse feature rare book shops and the Bod. features in Morse and Lewis. The parents of Myka Bering in Warehouse 13 run a rare bookshop which features in an episode in series 1. A typescript copy of the ZFT Manifesto is sought from a rare book dealer in an episode of Fringe in series 1. Oh, and 'The Ninth Gate' is an interesting idea turned into a really lousy movie.